There is no good terrorist or bad one was the stance that India had maintained for long. Perhaps, it may have to change this position, now that it has sat on the same table as the Taliban in Moscow. The official spokesperson of the ministry of external affairs, Raveesh Kumar, is having a difficult time explaining that India was represented at the meeting at a “non-official level''. Retired IFS officers, T.C.A. Raghavan, who was the high commissioner to Islamabad, and Amar Sinha, former envoy to Kabul, are right now sitting at the same table as representatives of the Taliban at a conference hosted by Russia. What exactly makes the status of the two representatives “non-official” is something the MEA is unable to explain clearly. The two have been officially nominated to represent India; they are not there in their individual capacities or as representatives of a think tank or NGO. India's quandary comes from not wanting to burn the bridges with Russia, which has been an all weather friend to the country. India wants to maintain the delicate balance between placating Russia and aggressively wooing the US. Russia believes that the solution to Afghanistan crisis is a political one, and will need to involve the Taliban. 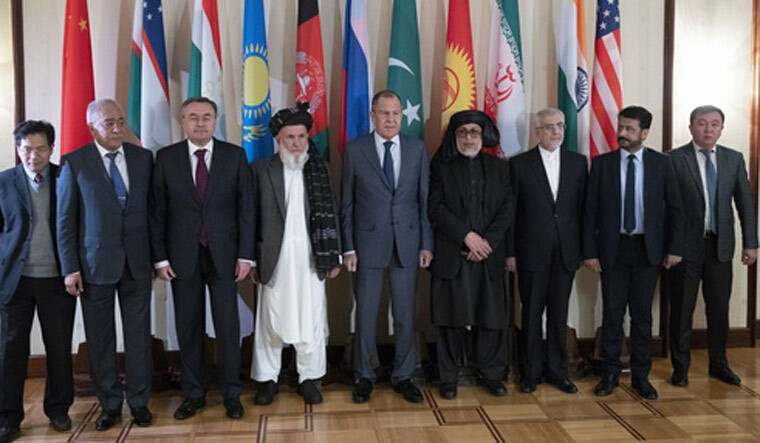 In the past too, India attended two meetings, spearheaded by Russia on the way ahead in Afghanistan, but the Taliban representatives were absent for these meetings. In September this year, Russia had to call off a meeting that was planned as Afghanistan backed out saying the Taliban had disrespected internationally sanctioned principles and rejected the message of peace. This time, however, the Afghanistan government has sent members of its High Peace Council, including former governor of Bamyan Habiba Sarabi for the conference. Earlier this year, in an interview to THE WEEK, Abdul Hakim Mujahid, member of the High Peace Council and representative of the Taliban to the United Nations during its regime, had said that peace in Afghanistan could not be wrought without the involvement of the Taliban. Afghanistan president Ashraf Ghani has, on several occasions, said they needed to talk with the Taliban, but he has also added he didn't trust the intent of the Taliban (for establishing peace). The US too has made tentative steps towards engaging with the Taliban. India is now hanging on to a straw to justify its participation in the meeting. As the spokesperson said, India's Afghanistan policy is consistent in that it will support any initiative that is Afghan-led, Afghan-owned and Afghan-driven to bring peace and stability to the region. Kabul's decision to send non- official representation, therefore, was the cue for India to do the same. The spokesperson also insisted on two more words that described India's Afghan policy, which were, that India supported “unity” and “plurality” . The Modi government, however, is not going to find it easy to explain why it can sit across from some terrorists at some table and not all. Former Jammu and Kashmir Chief Minister and National Conference leader Omar Abdulla has already criticised the decision, saying there were double standards in India's approach. He demanded to know why the government was not open to talks with non- mainstream stake holders in Jammu and Kashmir.